I APOLOGIZE FOR MY NEGLECT. I recently joined Hometta—part modern home plan company, part architecture magazine, part resources library. What do you like about your job? In addition to the job itself, I also like my lunch options. What about it? Everything. For those of you in Houston who seek the perfect taco, I suggest El Rey. My first day of work I was introduced to the El Rey Taco and Cuban Taco from the Shepherd location. The El Rey Taco, a grilled fish taco with "a touch of habanero mayo") was so good I couldn't stop thinking about it and simply had to order it the next day. You might be wondering why I didn't order the Cuban Taco. Probably because I couldn't decide between beef or chicken. The Cuban Taco is a beef or chicken fajita taco with black beans, plantains, and "a touch of sour cream"—an excellent combination. A Mexican restaurant scores serious points if they have horchata on the menu, which El Rey does. And even more serious points if it's good horchata, which it is. I'm not saying El Rey serves the perfect taco in Houston, but it's hands-down delicious. All this to say, I'm back in the hot town, cool city of Houston. "WHAT'S MORE INTERNATIONAL than the union of two Chinese grad students from Taiwan who met at a Texas A&M honky-tonk?" asks my sister. Although I'm not sure about the honky-tonk part, the rest is true. 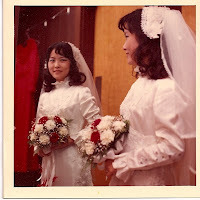 On March 15, 1975, Chengwei Sun and Chenyuan Chou were married in College Station. You didn't really think their names were Wei and Robert, did you? I'VE ALWAYS LIKED ABC's World News with Charles Gibson. I've always found it educational, tasteful, and far, far better than the local news—Live at Five—that precedes it. Today I caught the first part of Small World, a four-part series "that takes a global look at universal rituals including weddings, the family dinner, birthdays and vacations." I love stuff like this. For someone without cable television, this is the closest I get to National Geographic Channel and the like. In case you missed Small World, here are photos from Weddings Around the World. Also, don't miss The Bachelorette tonight. Who will DeAnna BLINKS-A-LOT Pappas pick? Jesse, the snowboarder with the label maker, or Jason, the guy with the kid? Fourth of July fireworks electrify the Houston sky. I WAS INVITED TO STAY with Emily and her bridesmaids at a hotel the night before the wedding. Hence my dangling countdown. The wedding weekend began Friday, with a luncheon hosted by Emily's mother honoring Emily and her bridal party. Later that afternoon, friends and family of the bride and groom convened at First Evangelical Lutheran Church for the ceremony rehearsal. As a hostess who would be greeting guests, asking them to sign the guest book, and handing out programs, I mostly sat and watched the rehearsal from a back pew. "Keep your eyes on your bride at all times," the pastor advised the groom. "Do not look at the bridesmaids." The pastor explained that someone in the back of the church would somehow notice the groom looking at someone other than his bride, and would bring it up at a cocktail party years later. Which I suppose could be scandalous considering three of the five bridesmaids were technically bridesmatrons. The ceremony rehearsal was followed by a dinner at the ambiguously Mediterranean Chatter's Cafe & Bistro, where we later installed ourselves—in chairs on a parking lot facing a typical apartment complex—to watch the somewhat lackluster Fourth of July fireworks. Apparently while watching the fireworks, some of which were big, ugly smiley faces, Emily's niece exclaimed, "I just don't know how they do it." And even though fireworks kind of bore me, I don't know how they do it either. The next day—the big day—we accompanied Emily to her hair and makeup appointment at Norris of Houston Salon and Day Spa, which, aesthetically, evokes a Bombay Company stock room, in which Miss Havisham lives, on crack. Nonetheless, we left the salon with a beautiful, happy bride, which was obviously more important. Back at First Evangelical Lutheran Church, a modest-sized church with a Northern California feel, the bridesmaids helped Emily into her gown. When she made it inside the gown, joyful shouts erupted. Of course, I had my back turned to them and missed this apparently monumental moment. Fortunately, I did capture some other great moments. Click on the photo above for some of my favorite shots. 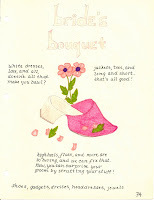 On a last note, I did not catch the bouquet (the bride's sister did). I have a feeling, to my chagrin, that my mother was hoping I would, and wishing I had. IN THE PREMIER ISSUE of Fingertips, there is a two page spread on bridal footwear. I have a feeling there was supposed to be more than what was "printed." But it is wedding-related nonetheless and therefore appropriate for my countdown. 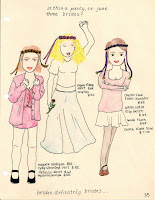 At eleven years old, I envisioned the modern bride—on a budget. There is no mention of the wreaths on the brides' heads, but it's possible they were inspired by the Renaissance Festival. ALTHOUGH NOT A HUGE FAN OF COUNTDOWNS, I have decided to count down to my friend Emily's wedding, at which I will be a hostess. I will count down to her "big day"—she hates this phrase—with wedding-related media. Before the official countdown begins, you can view a selection of photos from Emily's recent lingerie shower, hosted by our mutual longtime friend Tiffany, at her and her husband's home in Spring, to which I happily carpooled. The bride-to-be's older sister promptly left after one too many sumptuous bustiers emerged from their Victoria's Secret and Frederick's boxes. The future sister-in-law gave Emily a Victoria's Secret gift card, for obvious reasons. One of my favorite pastimes when I'm at my parents' house is to look at old photo albums. I often find myself, sitting Indian style on the carpet, hunched over piles of mismatched photo albums. Some of the albums' pages have yellowed considerably. Some have completely come unbound. Yet, the photos remain carefully arranged underneath the sheets of thin plastic. In my sister's baby album, fortunes on small white paper rectangles from long eaten fortune cookies whimsically adorn the margins. The rounded edged photos, now tawny in color, slide off the pages on which they once adhered. 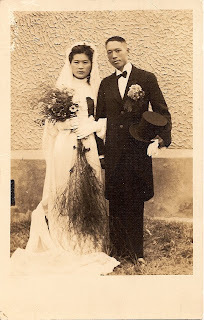 Somewhere in the pile of photo albums lives the wedding photo above of my paternal grandparents, taken in 1943, in the city of Yong'an in Fujian. Three years later, my father was born in Shanghai. Another son and three girls followed. If you turn the photo over, you see it is actually a postcard, which I imagine they had made and sent to a number of people with a message of the "Just Married" variety. 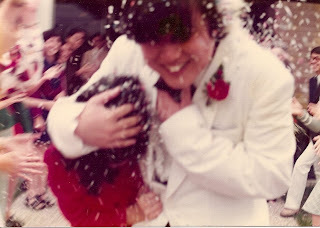 In fact, having a small wedding (though, according to my father, his parents' wedding was a rather large celebration) followed by mailing out wedding photo-postcards sounds kind of nice. For whatever reason, this particular wedding photo-postcard was never sent and, sixty-five years later, ended up in the hands of their granddaughter. Kristen Wiig on SNL Weekend Update as Aunt Linda. For those of you who still watch Saturday Night Live, you may know of Aunt Linda. She is a cultural correspondent of Weekend Update, and anchor Amy Poehler's aunt. I have an Aunt Linda as well—my mom. While Aunt Linda reviews movies out in theaters, Mom reviews movies out on DVD. And while Aunt Linda is kind of mean, Mom is kind of cute. Here is what Mom has to say (and wants to know) about Becoming Jane starring (the delicious) James McAvoy and (the kind of boring) Anne Hathaway. Me: [referring to Anne Hathaway] She was one of the wives in Brokeback Mountain and The Devil Wears Prada. Mom: She was Ledger's wife? Me: No, Heath Ledger's wife was Michelle Williams from Dawson's Creek. Mom: Are they speaking British? Mom: [referring to James Cromwell] I've seen that man before. Me: He was on Six Feet Under. Me: Actually, that's Maggie Smith. She's looked like that forever. Mom: [referring to Tom and Jane] Are they gonna get together? Mom: [referring to John Warren during the cricket game] He's not dressed right for this. Mom: [referring to James McAvoy] He's too small. Mom: That's why I don't like small men. Me: Fair enough. He's starring in a new movie with Angelina Jolie, you know. Mom: But he's so small. Me: Would you marry for money? Mom: I think Jane is a little bit stupid. Me: For not running away with Tom? Me: But what if you ran away with Dad and he couldn't give money to his brother and sisters anymore? Mom: Tom said he could earn money. But then Jane said they would live a hard life and have no love. More than six months later, Rice University student Matthew Wilson's car has been found, in West Berkeley. Which confirms that I was mistaken the handful of times I thought I saw him in the Paris underground. The boy himself is still missing. You can read "the full story" in the Rice News and The Berkeley Daily Planet.